What started as an Eagle Scout project by Joseph Storey, has culminated in a true community asset. 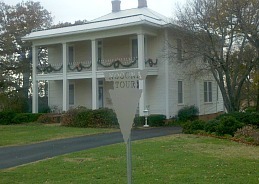 This walking and/or driving history tour helps inform people about the historic value of Nocona, as it showcases significant homes and businesses in the community's history. Sites are marked with metal arrowhead signs and a map showing the location of the signs and the individual sites' significance to Nocona may be obtained through the Nocona Visitor's Center, which is located inside the Tales 'n' Trails Museum.